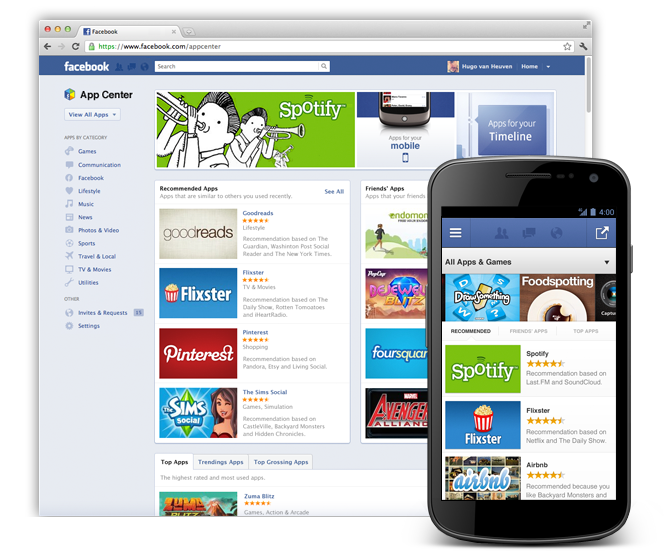 Facebook’s App Center is available to Canadian users today, the social network announced. The App Center was first announced May 9 and launched south of the border in June. It provides a central online location for Facebook apps such as Farmville, Draw Something, Spotify, Nike+ Running, and Pinterest. It is similar to app stores available for mobile platforms including iOS and Android. The App Center will soon be accessible to Canadians via the Web, and in the iOS and Android Facebook apps. Facebook says the online marketplace is an opportunity for developers to grow their user base. Not every app is listed in the App Center, but only those that receive high enough user ratings and engagement on Facebook. Developers can see this information through Facebook’s Insights analytics. Facebook’s App Center is now available in Canada. The June launch App Center in the U.S. saw 600 apps included. Users get a personalized experience with recommendations based on other apps they use and the apps their friends use. Facebook says that 230 million people play games on Facebook every month and that 130 games have more than 1 million monthly active users. Developers are encouraged by Facebook to create app detail pages. It’s a requirement to be listed on the App Center and it allows users to read information about an app and view screen shots before actually installing it. Developers can make money from their apps by selling them as part of Facebook’s beta program to collect a flat fee for using an app, or developers may offer in-app purchases. Facebook hasn’t said if it will rename it to App Centre for the Canadian market.